The Ferno Model 4000 Ultra Care Lift is manufactured with durable all-steel construction and powder-coated for a long lasting finish. The 24-volt battery offers smooth operating electric power that requires minimal effort and only one man to operate. 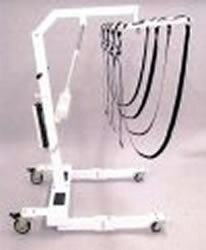 The Ultra Care Lift is simple to maneuver and carries both bodies and caskets. It disassembles for easy transportation and storage. Boon Height on End . . . . . . . . . Raised 73 Lowered 46"
Base width . . . . . . . . . . . . . 39.25"
Base Length. . . . . . . . . . . . . Folded 25.75" Unfolded 42.25"
Mast Length. . . . . . . . . . . . . 60"
Mast Width . . . . . . . . . . . . . 16.50"
Weight . . . . . . . . . . . . . . . 175 lbs.